Many Nigerians may not know some state governors, but it is hard to find a politically conscious Nigerian who does not know Governor Rochas Okorocha of Imo State. Positively or negatively, Okorocha is always in the news. The most interesting thing about Okorocha is that he seems unperturbed about whatever negative thing is said about him. He even seems to court controversy. If Mr Nnamdi Kanu of Radio Biafra and his supporters call him Okoro-Awusa, he laughs over it. He calls himself Okoro-Awusa. Even his fellow governors tease him with that name. However, if one judges Okorocha based on the amount of criticisms heaped on him, one would think that Okorocha has been an unmitigated disaster with no achievements recorded in office since 2011. When I was in Owerri and some parts of Imo State in 2014 and 2015, I noticed that many big projects were in progress at the same time. Bridges were being built. Roads were being constructed and widened. Buildings were being constructed. Especially, in the state capital, Owerri. But some of the projects seemed to have been abandoned. Okorocha was accused of biting more than he could chew by embarking on so many projects beyond the capacity of the state. It seemed as if most of the projects would be abandoned because of lack of funds or other reasons. The drop in the amount of allocations received by the states also made it likely that Okorocha would not complete most of the projects he started. Imo State is already owing a backlog of salaries and pensions like many other states. Surprisingly, when I returned to Imo recently, I noticed that almost all the projects I saw some three years ago had been completed, especially the bridges and roads. Most of the roads had been dualised. Ornaments were placed on most of the streets in Owerri to make them look beautiful. Roundabouts were also constructed at different locations. Markets that used to cause traffic jams had been relocated. Because of the widened roads and relocated markets, traffic jams were virtually non-existent in Owerri. Outside Owerri, the wide roads also got my attention, given my knowledge of the size of roads in my home state, Anambra. What I saw was an Imo State that was planning for the future, knowing that the population of the state will explode in the decades ahead, and traffic will be terrible, if nothing is done today. Unlike in Anambra State where there is hardly any dual carriage way except the two Federal Government roads (Enugu-Onitsha Expressway and Onitsha-Owerri Expressway), many of the roads in Imo State are now dual carriage ways. In addition to reducing traffic jams, dual carriage ways reduce the probability of accidents, especially head-on collisions. In Anambra, no governor has had the courage to expand the existing roads to create dual carriage ways that connect towns for fear of incurring the wrath of the people whose fences may be pulled down. But in Imo, Okorocha has done it. In Lagos, Mr Babatunde Fashola did it and Mr Akinwunmi Ambode is also doing it. There is always the fear among most politicians that anyone who does a thing like that will be hated. But such fears have been proved to be false. Even though those who are affected by road expansion usually feel bad, the majority of the people love a governor who is courageous to pull down fences and even houses for the sake of road expansion or development. The advantage Anambra has over Imo is that Anambra has a better road network and more durable roads. The roads constructed over 10 years ago by Dr Chris Ngige and Mr Peter Obi are still smooth. 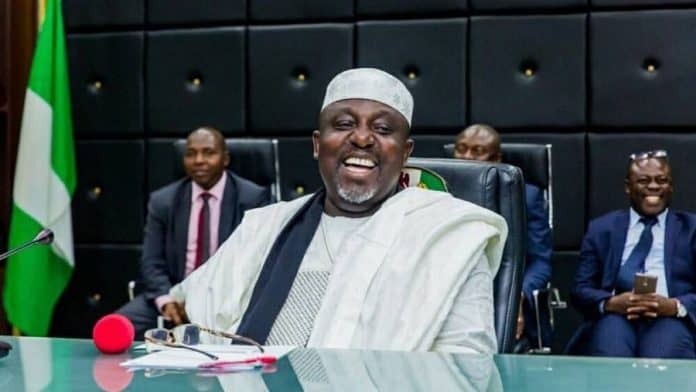 But the roads constructed in Imo by Okorocha have not shown such durability, even though the state government has accused heavy-duty trucks bearing cement and petroleum products as being the agents of destruction of Imo roads. These trucks are indeed a terror to roads but Imo State is not the only state where heavy trucks ply. However, in spite of whatever achievements Okorocha has recorded in Imo State, he has not helped himself with his attitude to the public. He jokes a lot over every issue. He makes comments sometimes flippantly in public, not minding how these comments are perceived and interpreted. Okorocha’s problem seemed to have started the day he defected from the All Progressive Grand Alliance to the All Progressives Congress. It was seen by many people from the South-East as betrayal. Okorocha has also not made much effort to make his South-East people love him by his political utterances. He believes he is a realist who tells his people the undiluted truth about how to play Nigerian politics. He seems to have studied the politics of Nigeria and come to the conclusion that if he has to achieve his age-long ambition of being the president of Nigeria, he does not need to be the darling of his South-East. Chief Olusegun Obasanjo did it in 1999 by becoming the president of Nigeria without the support of his South-West people. Okorocha seems to believe that for him to be seen as a detribalised Nigerian, he needs to align more with the North and also project himself as a politician with international appeal through his foundation. Ironically, many of these factors have combined to work against Okorocha and becloud his achievements in the state. He is a self-confessed man with big ideas that enjoys embarking on big projects. He is also a governor that knows how to mingle with the common people and act in a way that endears him to them. But he does not seem to be someone who listens to his advisers; or maybe, his advisers are afraid of advising him and losing their jobs. He also seems not to be strategic in his corporate communication, which makes him always responding to allegations, rather than being proactive. Okorocha is a kind of politician that is difficult to understand. His tenure in Imo can only be fully assessed years after he has left office. But he should pray that the bad press does not becloud whatever achievements he may have recorded.